The lightweight Cordless Straightener specially designed for traveling and backstage work, is the perfect tool for quick, effortless straightening and easy curls and waves. The advanced titanium floating plate technology delivers the ultimate styling results with a silky, shiny and healthy finish. Heats up to 200 °C/ 392 F.
2. Plut into a suitable power source. 3. Charging time 4 hours. 2. 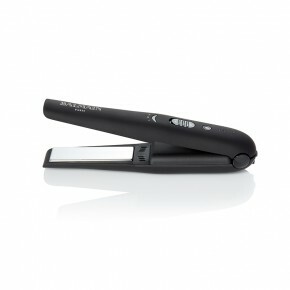 Allow the Professional Cordless Straightener to heat up for 30 seconds. 3. Ensure the hair is dry and combed through. Seperate a section of the hair. Place the hair between the plates, close to the roots and press down firmly. Take care to not touch the scalp. 4. Hold the hair firmly between the plates, maintaining the same tension and slide the iron down the length of the hair from root to tip. 5. Release the pressure from the handless and let the hair slip out. Allow the hair to cool before combing through. 6. After use, switch the iron off and allow to cool before safely storing in the pouch. 7. Use the Locking Switch for safe storage. Helps to protect the product from damage when not in use.